Trying to find a different venue for discussion, the organization turned to social media to disseminate administrative information directly to citizens such as construction notices. However, despite having a strong presence on Twitter, Facebook and Instagram, the social posts – which went out up to three or four times a day – weren’t enough, says Fitzi. “I was looking for something where people could join the discussion, as well as see what we were doing on Twitter and on Facebook – but all on one page,” he says. In 2015, after stumbling across ScribbleLive on Blick, one of Switzerland’s largest newspapers, Fitzi realized he had found a solution to his communication problems. “I knew right away that this was the right thing. We had to get it because it was what I was looking for: An offering that had a blogging tool but also something that I could use to aggregate all our social media channels,” he says. 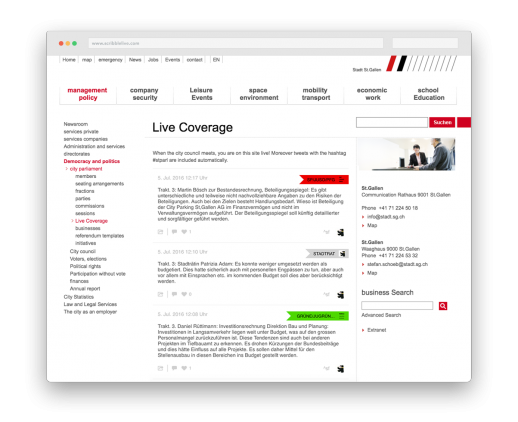 Today, the ScribbleLive portion of the St.Gallen site features a live blog, a Twitter feed, a construction project channel and other elements that keeps citizens up to date, enabling two-way, instant communication. Using these tools, constituents can reach out directly to all of the city’s various departments such as mobility and transportation, economy and employment and education. This ability is especially important in Switzerland, which is a direct democracy, since the people rather than elected officials make decisions both big and small about the country. The more information the city can disseminate, the better prepared its citizens will be when voting on issues. One of the first things constituents used the tool for was to complain that the color of an online parliamentary flag was the wrong color orange, and Fitzi was able to change the color in real-time with ScribbleLive. However, the most important feature of ScribbleLive is the fact that citizens don’t need to have a social media account to talk to city officials, says Fitzi. They can be “live” in parliament with only a browser and a web connection via PC, tablet or smartphone. “People are telling us it’s good to have this new tool because it’s much easier to read and they like to follow parliament this way. 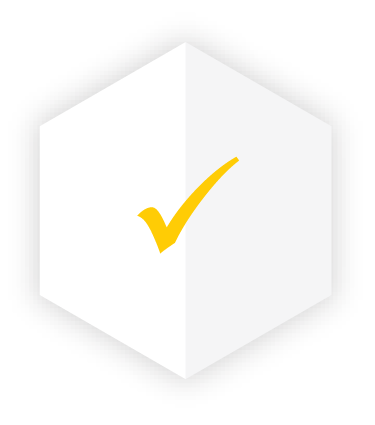 It’s easier to understand.” Members of parliament are happy with the benefits of ScribbleLive, as well, expressing their satisfaction with the tool in a recent parliamentary session. People are noticing outside St.Gallen, too. 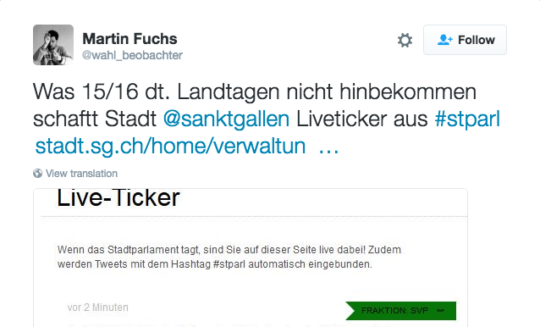 For instance, Martin Fuchs, a popular German policy advisor recently tweeted the following: “German state parliaments can’t do what the City of St.Gallen is able to: Doing a live blog out of a city parliament.” Another newspaper – St.Galler Tagblatt – published an article in which the local MPs highlighted the importance of cities having an active social presence, and praised the city for its implementation of ScribbleLive and its improved user engagement. Going forward, Fitzi says the tool can only make things better for the city’s inhabitants. For instance, Fitzi plans on using ScribbleLive more extensively for big projects as well as regular, one-hour live chats between the city’s authorities and its constituents.